The three videos below were circulated over the past month in the build up to the Future of Work is Human Big Tent, taking place (tomorrow) on 12 October 2016. Created and curated by Jericho on behalf of CIPD, the interviews with Damian Green, Margaret Heffernan and Charles Handy, are starting points for a discussion to reshape the world of work. Speaking on the need for introducing new energy to the work debate, Damian Green, Secretary of State for Work and Pensions, says: “Some of our attitudes towards work have remained slightly stuck in the past, so I am very interested in the radical new thinking that will take us forward”. On the subject of adding humanity to the world of work , writer and philosopher Charles Handy highlights the need to do away with the ‘turn-up-to-go-home’ attitude people have towards their jobs. He speaks of the need for an education system offering “real preparation for the world outside”, one that is about forming character and resilience, not just knowledge accumulation. 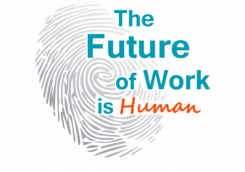 Thoughts, provocations, and ways forward that come out of the Big Tent discussion will all be posted on the Future of Work is Human web platform.